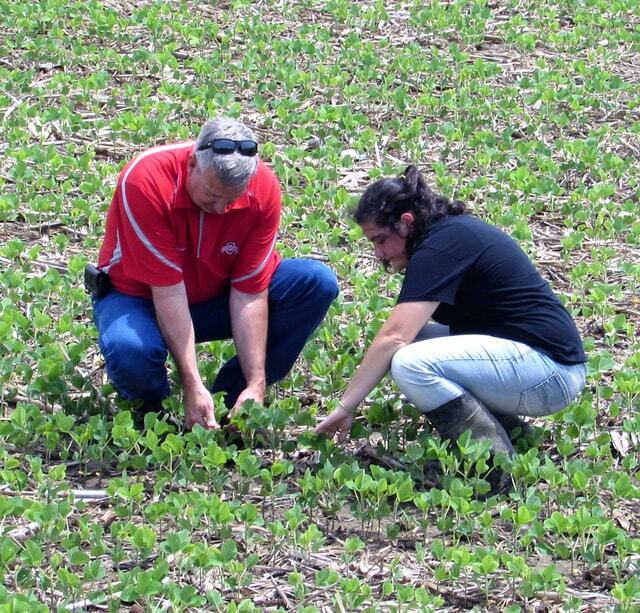 Sam Custer (left) of the Darke County OSU Extension examines soybean plants with intern Taylor Dill, seeking to determine the effect of the past week’s rainfall on the crop. DARKE COUNTY — Sam Custer, educator with the Darke County Extension of the Ohio State University, said that though Darke County had an extremely wet week, farmers did not see as much rainfall as other counties in Ohio, and this will not likely have an adverse impact on local crops. “As far as rainfall goes, we’re probably in as good of shape as anyone,” he added. Custer, accompanied by Taylor Dill, an intern majoring in Agronomy at Wilmington College, spoke to the Daily Advocate as the two examined soybean and corn fields in northeast Darke County. Custer doesn’t expect the soybean crop in Darke County to suffer terribly, though he believes the yield will be lower. According to Custer, soybean planters got off to a late start this year due to wet conditions, which already put many growers at a disadvantage. As for corn, he believes the crop will be less affected by the heavy rains than soybeans. “The corn yield in Darke County will probably be close to what we had last year if we get good, timely rains,” he remarked, emphasizing “timeliness” as the key to successful yields. Ultimately, Custer maintains that further heavy rainfalls could negatively impact both crops. “We don’t want another three inches in the next 10 days. It would further stress both corn and soybeans,” said Custer.